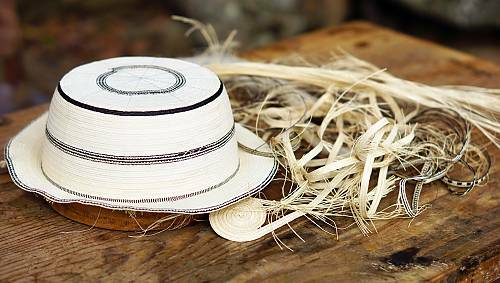 The United Nations Educational, Scientific and Cultural Organization (UNESCO) has recognized the artisans of Panama for their woven hats. Cultural authorities have added the pintao, or painted hat, to UNESCO's List of the Intangible Cultural Heritage of Humanity. "The pintao hat has become an integral part of regional outfits throughout the country worn during traditional dances and community festivities," UNESCO's statement said. The pintao is different than the widely known "Panama hat." The Panama hat has a wide brim. It is traditionally made in Ecuador from the straw of the toquilla palm plant. It is thought to have earned a misleading name during the Gold Rush in the 19th century. Many were sold in nearby Panama to people traveling to California in search of gold. Artisans make the pintao by hand. They use five different plants and even a small amount of dirt to create it. The hat industry's center is in La Pintada, a district about 170 kilometers west of Panama City. Reinaldo Quiros is a well-known artisan and designer who sells hats out of his home. "They don't have anything (artificial), no machinery; no factory as such exists here in La Pintada," he said. "Each artisan in his own home makes the hats maintaining the techniques taught by his ancestors." Artisans of the truly Panamanian pintao hat start with the fibers of several plants. They cure and then weave the fiber into braids. Then, they wrap the braids around a wooden form and sew it together from the crown of the hat down. Depending on the quality of the work, some pintao hats can cost hundreds of dollars. Authorities estimate that 4,000 of La Pintada's 25,000 residents work creating or selling the hats. Pedro Mendoza, a 50-year-old hat maker, hopes that the UNESCO recognition will help take the pintao hat beyond the country's borders. "It's really good what's happened," he said. "The hat for us is a way of life." The idea of traveling to the moon has little attraction for me. The book reveals the story behind this traditional dance. To work out a plan, one has to start with investigation. Melville managed to get by on a small amount of money. 5.Many were sold in nearby Panama to people traveling to California in search of gold. He framed this question three different ways in search of an answer. He has had to travel the country in search of work. 6.Depending on the quality of the work, some pintao hats can cost hundreds of dollars. I tend to have a different answer, depending on the family. Depending on your circumstances you may wish to opt for one method or the other.